Well, better late than never, but we're finally here. Sorry this took even longer. Much like Deathmatch 2, a somewhat busy life can hamper free time for tournaments. Handling two tournaments at once is much more difficult than when I first thought, especially one as complex as this. So, let's get the ball rolling now. Match-ups, Videos, and Rankings will be posted weekly, but I will do everything possible to record everything within this week. Won't be easy though. 18+ v Why not lift. Merry blatantly late Christmas and happy blatantly early new year. Sorry that this took a while. Time and motivation was slightly off track, but we're back. I am tempted to possible at least record this first, then focus recording on RMP2, but if you do feel I should focus both at the same time anyway, then let me know. 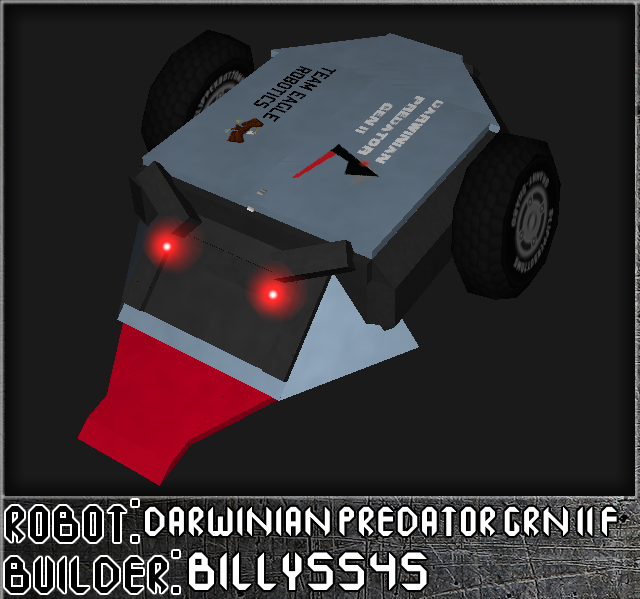 Darwinian Predator Gen II is a Modular Bot. You can view it's alternate form here. - No BFE, AAM, Hax, CF, etc. 8bean said he would host, and I have sent my bot to him. Thanks dude, and Good luck Pip. 8Bean is the host. Good luck. 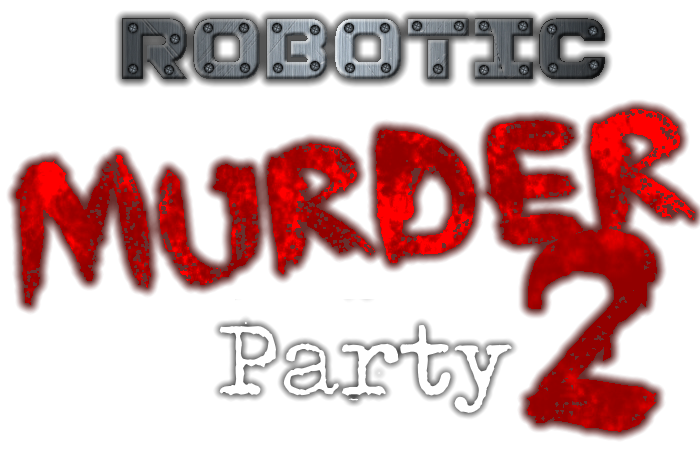 So if you remember about two years ago I did a tournament known as "Robotic Murder Party". If you're unfamiliar with the concept, it's a Stock MW tournament where you do battles against other bots, where losers must survive in mini-games. It all comes down to the living and dead fight to who earns their right to stay alive. Basically, Trivia Murder Party from Jackbox games, but with bots. Was pretty fun in the end, if a bit complicated. I didn't really think of doing a sequel, but then I notice a lack of stock tournaments, and watching stock bots fights can be pretty fun as well. So most of this may remain similar, but with a few changes to hopefully make certain mini-games more interesting, and hopefully everyone enjoys it really. 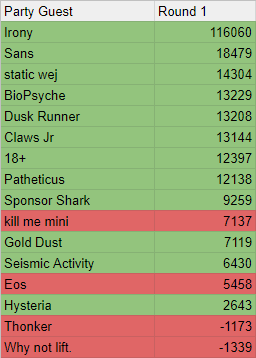 - One entrant per person, but in the event that signups are going slow, I will allow people to send a second bot. - You cannot enter unless your bot is received and accepted. - I won't be entering as I will building some bots for the minigames (See Minigame Rules for more details). 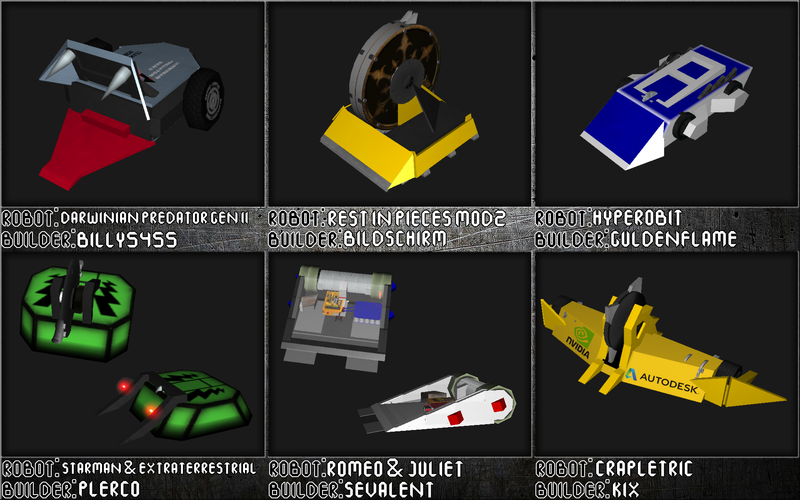 - Your bot must be one that you built yourself and showcased in some way to prove that it's your design (this is to prevent placeholder bots, or bots straight up copied from another builder, and on top of that, you CANNOT send me a simple re-skin of someone elses bot and call it yours). - You cannot use BFE, AAM, Hax, Component Freedom, .txt file editing, etc. - I will allow most stacks that have been done multiple times, but if I find something highly questionable, then I will ask you to show me the proof if it's legit. - The Rule of 7 Break is allowed. - AI parts are allowed, including the 140 cm extender. - The only cheatbot2 part that is allowed is the Flamethrower. 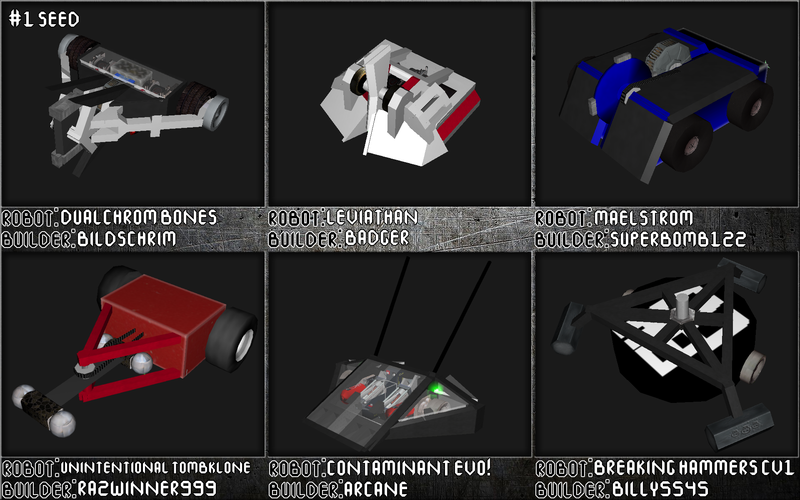 - The only custom components that are allowed are from 090901's and/or Sage's Skin Pack and Madiaba's Smart Zones. - Bots must have powered two wheels minimum, and both wheels must show any form of controlled movement. - Crawlers and Multibots are banned. - Bots will not be AI'd with Meltybrain tactics. - Modular designs are banned. - I recommend bots that are the best of your ability, so Jokebots, replicas, IRL style bots, etc. are allowed, but bear in mind that you will be at a severe disadvantage. - You can make an update once and only once (The only exception if it's a skin change or anything minor). - If an updated bot is illegal, then I will use the original bot you sent me. - If a bot does a Havok Explosion which costs the match for it's opponent, that said bot will get a free restart, if this happens again, that bot will be disqualified. 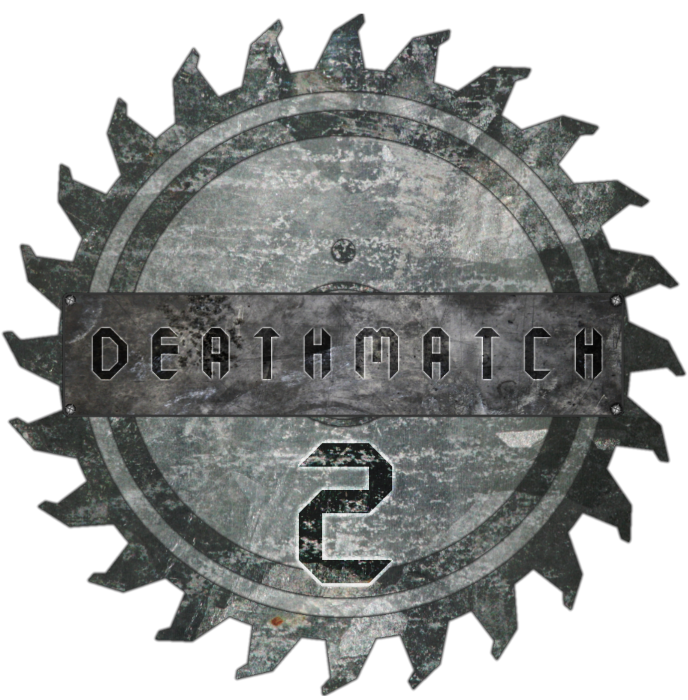 - Matchups will be randomized each Round in 1-on-1 Matches. - There will be most likely going to be ten videos released on a weekly format, with randomized draws for each of the battles and mini-games. - You will earn the amount of points that you had at the end of every match. 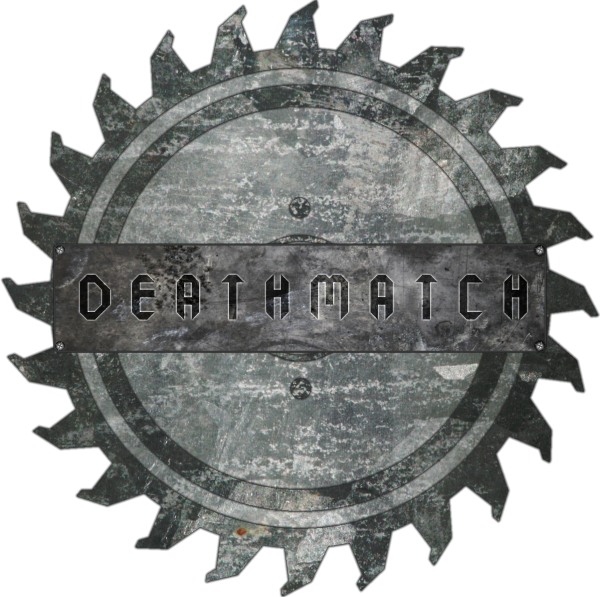 - The Winners of the matches will sit on the sidelines, and earn an additional 10000 points (Ghosts will earn 5000 points). The losing survivors will have to fight for their life in a mini-game (You will earn points if you do participate in these mini-games). - Survivors and Ghosts will fight among each other in their own respective groups. - Whoever has the most amount of points in their respective group will sit out for one round. - The last bot standing will advance to the final round (See Final Round rules). Special Note: If there is a lone victim in the killing floor, then everyone else will participate, and if any of them beat the lone victim in the mini-game, then the victim will die. - You will be battling a heavily armored bot with a tri-bar mace VS in the shape of a safe (Effectively it will be capable of fighting this time, and it's much harder than before). - These battles will have a one minute time limit. 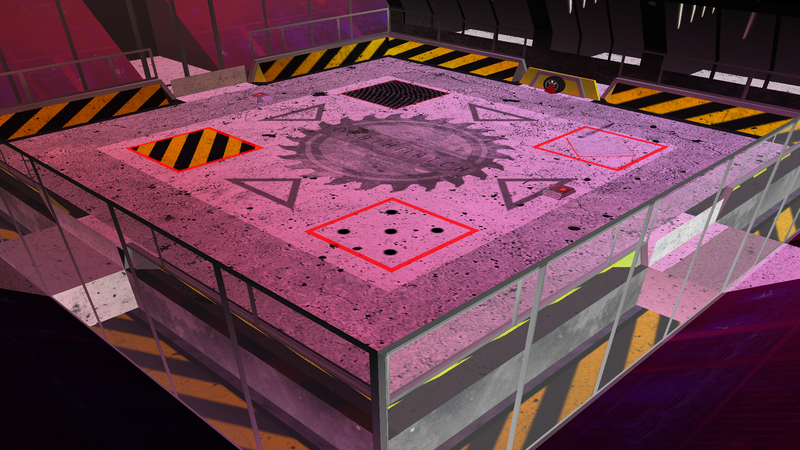 - The arena used will be the Containment Cube (Re-skinned, Hazards off). - The goal is to destroy the safe, but if don't destroy the safe within the time limit, you'll die. 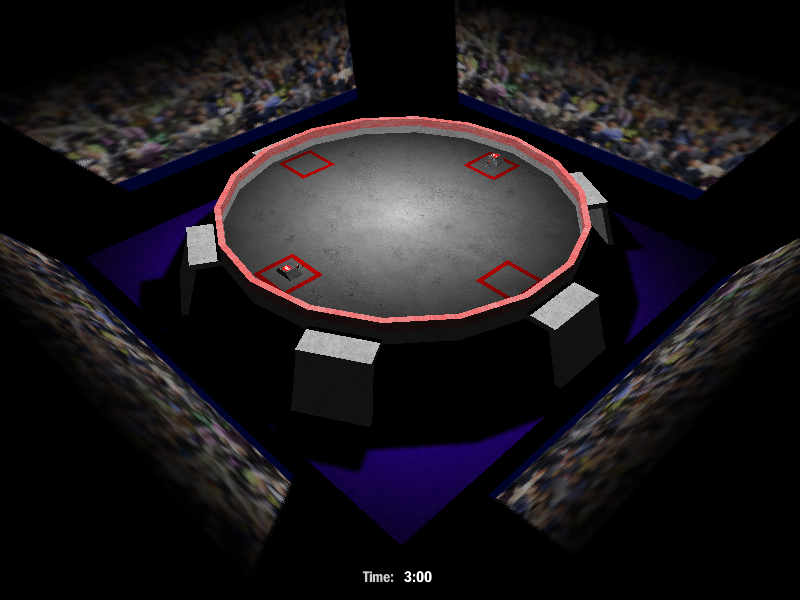 - The arena used will be the FlexTop Arena (Re-skinned, Hazards off). - Whoever lasts the shortest time against the pusher, you will die. - If you don't beat the crawler in any way, you'll die. *This will most likely be the fifth minigame, so beware. 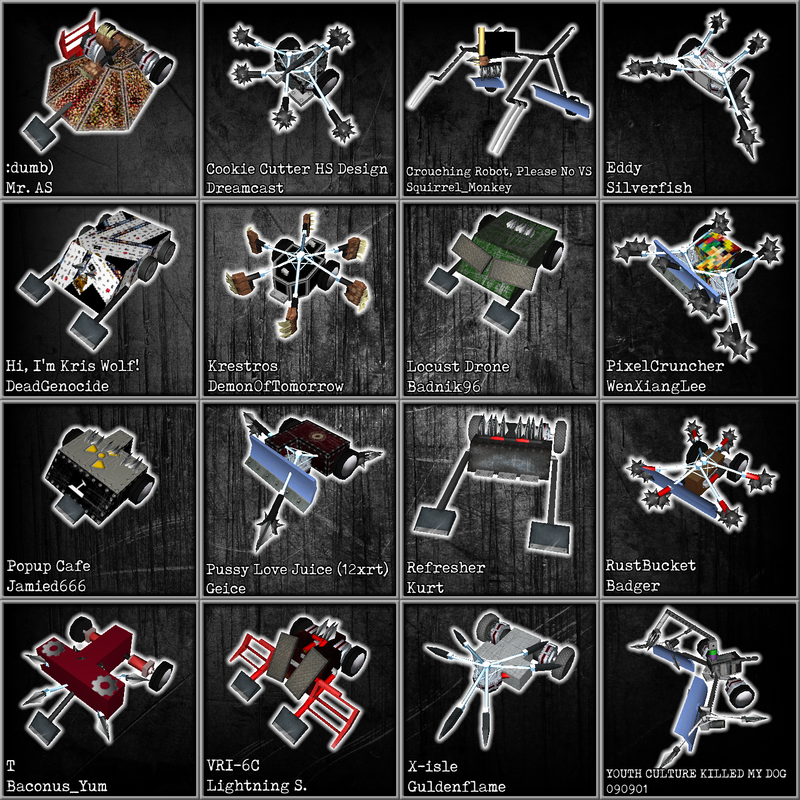 - Once signups are full, I will PM everyone beforehand on an antweight to choose beforehand. - Victims will be fighting one of 16 different AWs. - If you are a safe player, then you will have inserted a bomb inside, if you are not a safe player, then you will have chosen an AW to fight. - If the victims choose an AW that has a bomb in it, fail to beat the AW (somehow) or don't submit an AW to fight before the deadline passes, they'll die. - This minigame will be have four players maximum in randomly chosen groups (if possible), and everyone will face each other in a 4-way KOTH rumble. - Whoever scores the least amount of points, or if you don't score any points at all in the match in their respective group, you die. - The arena used will be the Electric Arena 2 (Re-skinned). - The goal is to remove as many components as possible, and if you remove the least amount of components or lose to EMERGENCY in any way, you'll die (removing every components will result in an auto win). - You will face off against two MW Multibot Popups. - The arena used will be the Low Lag Arena 3 (Re-skinned). - The goal is to last the longest time possible against the popups If you do not at least survive to the end of the match, you'll die (Beating both popups before time runs out will result in an auto win). - The goal is to defeat at least one or both bots, or (at the worst) survive to the end of the match. If you do not accomplish any of the following, you'll die. - You will face off against 6 MWs in a set order. - You will face each bot, 1-on-1, and if you win, you will advance to the next bot. *This will be the last mini-game if two or more bots remain within 10 rounds. - You will face off against a HW HS. - These battles will will have a one minute time limit. - The arena used will be the Keznorg IGC (Re-skinned, Hazards off). - The order of who will fight the HS first will be based on your scores. - If you fail to survive or beat the HS, you die. - This process will continue until there is one bot left. 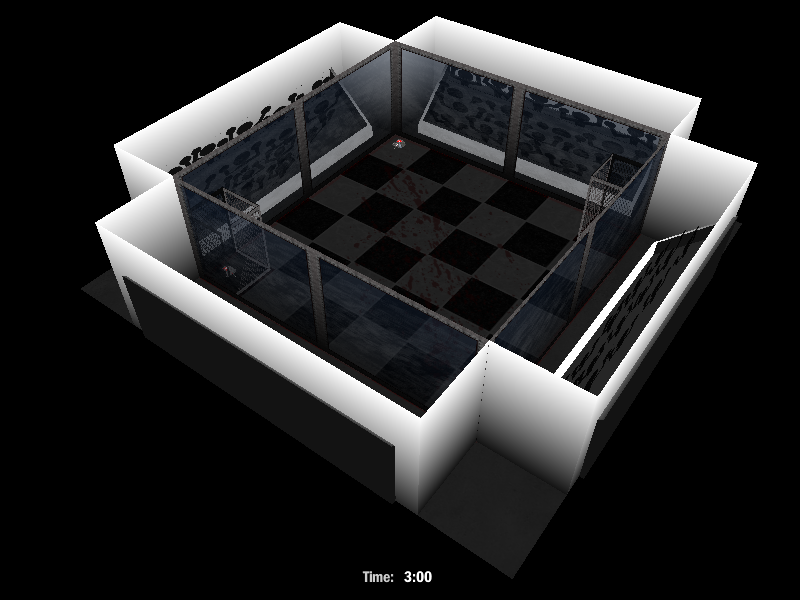 - The lone survivor must beat all of the ghosts to escape. - The matchup order will be determined by the scores from the previous rounds, from lowest will fight first, highest will fight last. 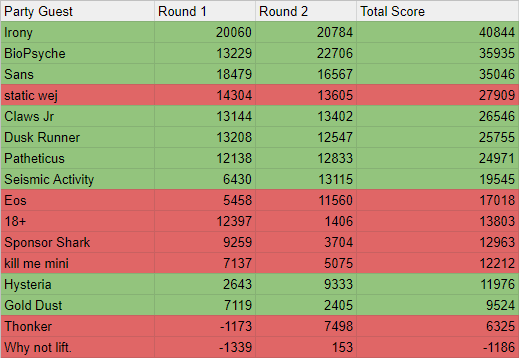 - Your final rankings will not change after the last round played. - Ghosts will have 3 chances in lives to beat the survivor, if the ghosts loses all three lives, then they are out, permanently. - If a ghost manages to beat the survivor, then they can steal the body and they get a chance to escape. - Whoever is the previous survivor will also lose a life depending on how many they had before they turned into a ghost. 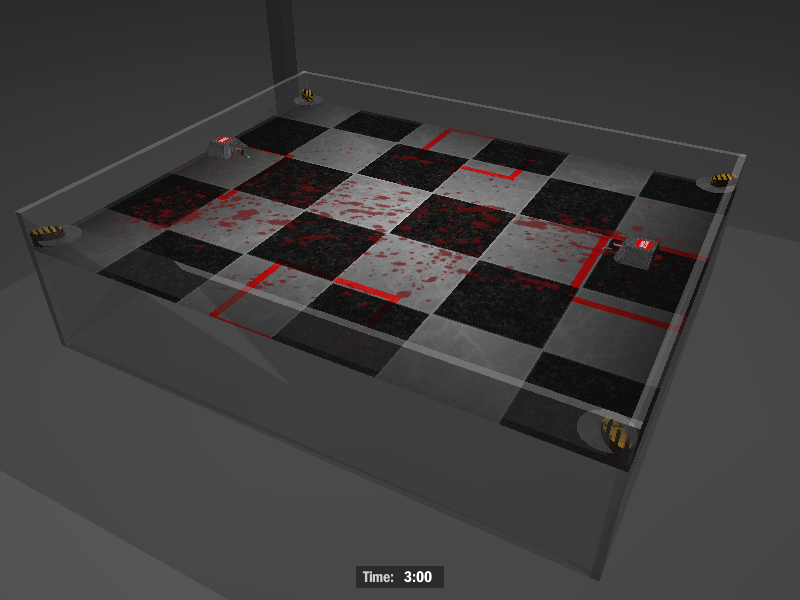 - The last bot standing will escape and win the game. 8. Sickle Robotics - Why not lift. 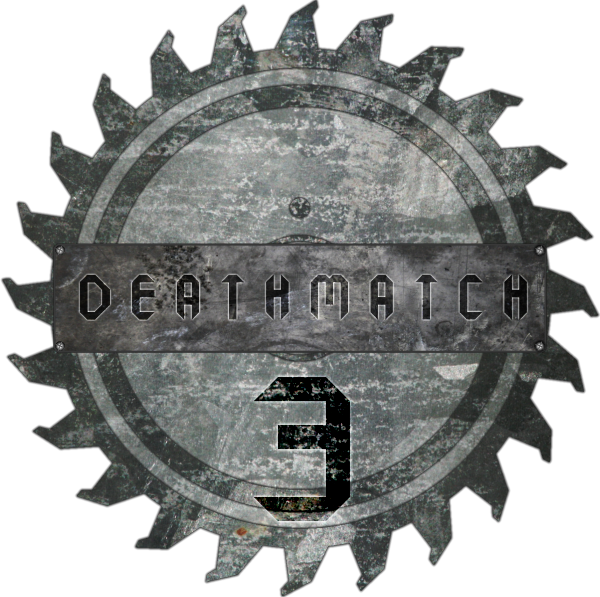 DISCLAIMER: I will be running this at the same time as Deathmatch 3 (If I'm allowed to anyway), but I hope to make both great in the end. This also is a bit of an experiment to see if I am capable of running two different kinds of tournaments in the end. - One bot per member. In the event that signups are filling up slowly, then I will allow Secondary Signups. - I can allow custom AI .py files if you need your entrant to do something specific that would otherwise not be possible with a normal .py file. However, if it that makes your bot overpowered or is pointless and/or just stupid memes, then the entrant along with the custom AI .py is banned. - You must have a minimum of powered two wheels attached and must show controlled movement with said wheels. 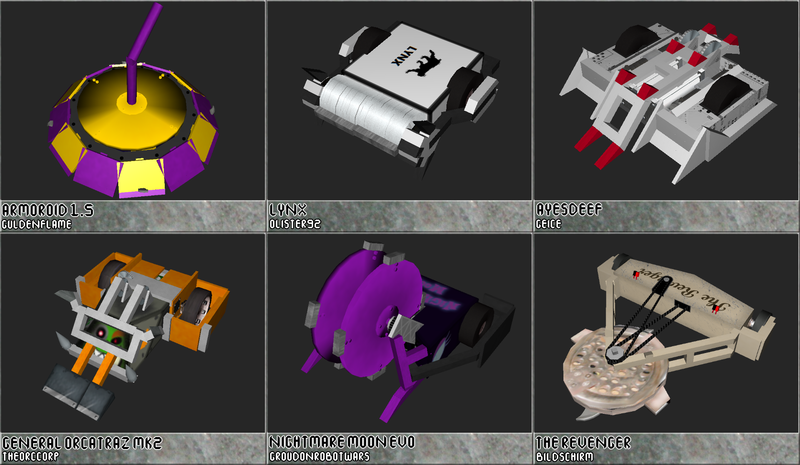 - Modular bots are allowed this time (Once the SBV thread is up, I will give a week maximum for you to send in a list of bots you would like to use your modular forms for each bot, and you must list what you would like to use as your default configuration. If you do not send me a list within that time frame, then I will choose myself for each battle, so don't blame me if this is the case. If two modular bots do happen to face each other, then I will just use your default configurations. - The Mechavore Disc & Minion Disc, however, are straight up banned. Period. - Flamethrower bots are allowed, but using that bot with EternalFlame.py or a similar AI python is NOT. - You can send your own component re-skins as long as you provide the necessary files to me when you enter and the ONLY change to said component(s) is the skin. - No components or anything similar from DSL 2.3 Beta, or whatever is currently going on. - You can make an update once and only once (The only exception if it's a skin change or anything extremely minor), but I will stop allowing updates when signups close. - If I am feeling mixed opinions towards the legality of your entrant, then I will ask about certain details to make sure. - In the event of Secondary Signups, then I will make sure both of your bots do NOT compete in the same heat. - Only minor havoks will be shown in a main heat video (or ones that don't really affect any major outcomes), and bots will not be penalized for havoks. However if a robot havoks more than enough times, then the robot will be eliminated and will be referenced to "technical issues" (If the builder would like to see a video of the havoks for proof, then I will upload said video, and for the record, I'd say 20 havoks or crashes would be a tipping point for me to just forfeit it and move on). - If my game crashes enough time for a specific match, then I will code it as an "Arena Breach" and take the most salvageable take with the least amount of havoks and do a judge's decisions from the match before the crash. - There will be six heats released on a weekly format, with randomized draws for heats and battles. - For the Pit Hazard, things will work a little bit differently. If multiple bots enter the pit at once, then the last one to enter the pit will be declared the winner. 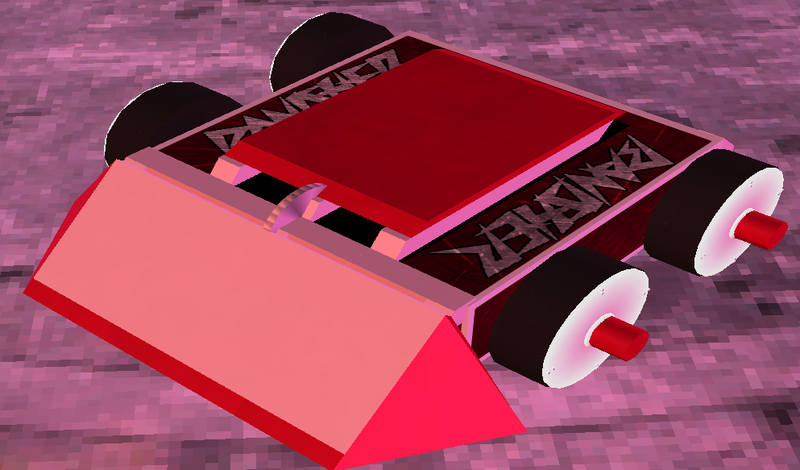 If one bot enters the pit, miraculously escapes, and another bot follows in the pit and stays, then the one who entered the pit zone first will be declared eliminated. - Seeded bots will have a dedicated heat draw for them. So Heat A will have Seed #1, Heat B will have Seed #3, Heat C will have Seed #5, etc. 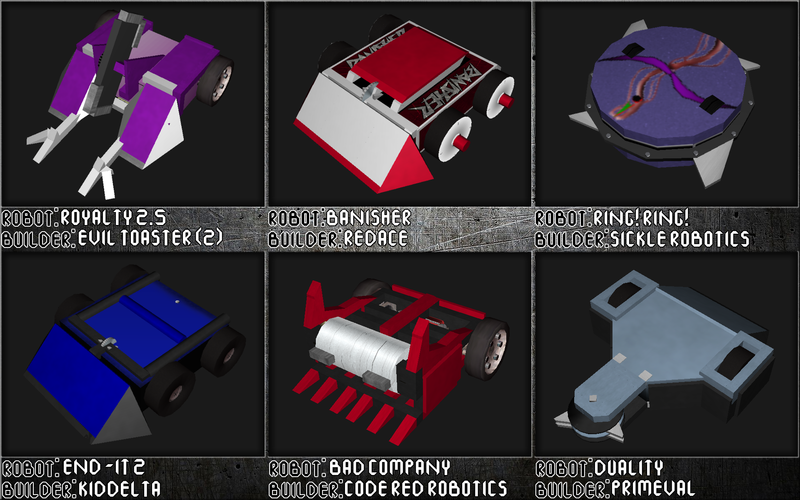 - In the six heats, there will be six bots in each, with two round robin qualifiers, with three bots in each qualifier. The winners of the qualifiers will advance to the Heat Final, and the winner of that will advance to the Grand Final which will work the same ways as the heats. - Winning a battle by KO, TKO, OOTA, Elimination, Immobilization, Whatever term for beating bots before time elapes-ation will earn you three points. Lasting at least to the end of a Judge's Decision will earn you one point, but winning said Judge's Decision will earn you two points total. In the event that all competitors in their qualifiers finish off in a tie, then a three-way melee tiebreaker will decide who will advance to the heat final. - If there is no clear winner at the end, then I will be judging every bot fairly on based on Aggression, Style, and Control. I will show a replay of the action, and the score at the end. Once a heat is posted, I will post my notes and details on why I made said decision inside a spoiler tag. 29. Sickle Robotics - Ring! Ring! Bold - Seeded Entrant claiming their guaranteed spot. DISCLAIMER: I will be running this at the same time as Robotic Murder Party 2 (If I'm allowed to anyway), but I hope to make both great in the end. This also is a bit of an experiment to see if I am capable of running two different kinds of tournaments in the end. So this has been in the workbench for a good two years now, but finally, it's released. Also, you will need the lastest patch as of 10/11/18. Just copy and paste the current files in your current AI folder. So many people way back in 2009 have been collaborating with a remade Stock AI with a similar name. While a Beta version was released of that, it never was truly complete, as it featured recycled bots from other AI packs, or just straight up unviable bots in today's standards of building. (This is me at least hoping my Stock skills are strong enough for most builders out there). But unfortunately, some parts just never truly got the full release it deserved, and most members of the original disbanded or just disappeared. So I, feeling a little bad about that, offered to assist in helping with the pack to help revive it, and while I did try to help, not much came from that, and after gaining some interest again, decided to do somewhat a re-imagining and remake of the entire project. A re-imagining of a re-imagining. How meta. 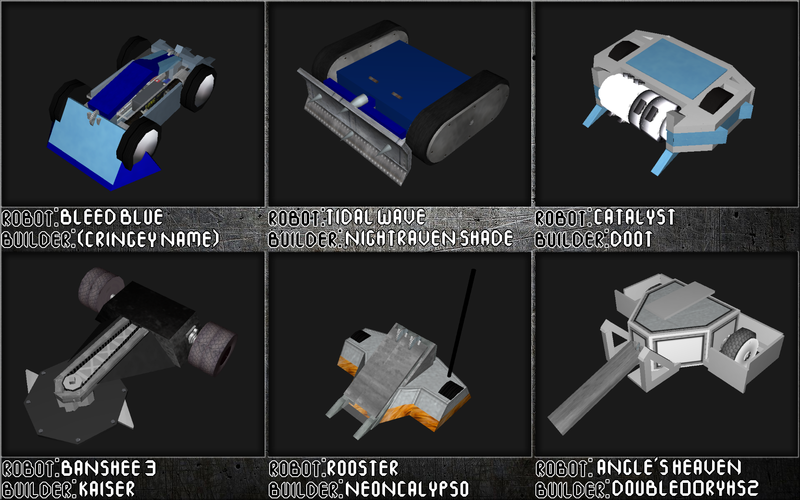 So in a way, you could call this technically an unofficial release of an AI pack, but this is mostly a tribute and assistance for one last hurrah, I guess that's a way of putting it. All you will need for this is a clean version of Stock 1.4, and everything should be good to go, but please do report back if there are any issues. - Secret Easter Eggs for anyone who can find them. NOTE: This will replace any bots in the first 3 slots for the first 15 teams. The Bindings will also override any custom teams that you may have added on from the first few slots in Stock, so beware. And that's all for now. I hope you enjoy! What, another already? Well, I felt people weren't happy with certain aspects of how the first Deathmatch was handled and I'm at least hoping some much better results and much less angrier people yelling at me. I'm not trying to sound rude, but I don't want to act like a pushover this time. In the end, this is all supposed to be a fun project. Please don't make this less fun for me this time. - Seeded builders will be allowed to have a reserved spot in the competition if they wish. - Weapon spam will not be tolerated. 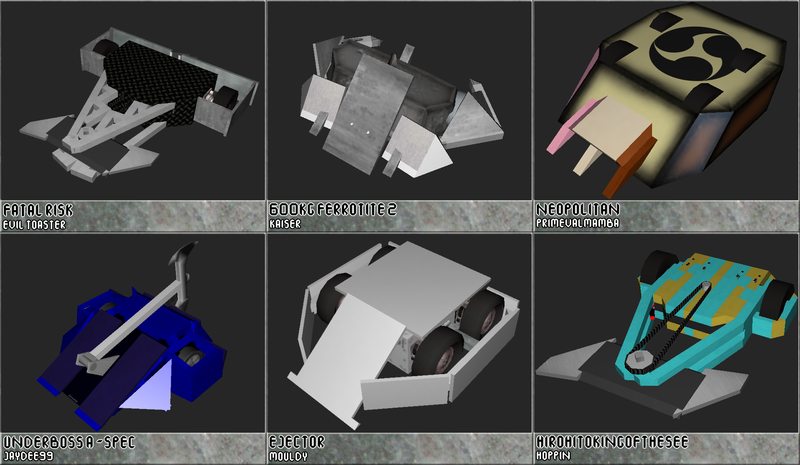 With that said, I won't limit the number of specific parts for an entrant. If there is a balance between weapon and it's power, then I can allow it. - The Mechavore Disc & Minion Disc, However, are different. You can attach one of them, but I will immediately remove it from your bot and you will compete without them. - Flamethrower bots are allowed, but using that bot with EternalFlame.py or a similar AI .py is NOT. - Extenderbots are allowed, but they might be havok bombs, so be careful. - You can send your own component reskins as long as you provide the necessary files to me when you enter and the ONLY change to said component(s) is the skin. - Only VERY minor havoks will be shown in a main heat video (or ones that don't really affect any major outcomes), and bots will not be penalized for havoks. However if a robot havoks more than enough times, then the robot will be eliminated and will be referenced to "technical issues" (If the builder would like to see a video of the havoks for proof, then I will upload said video, and for the record, I'd say 20 havoks or crashes would be a tipping point for me to just forfeit it and move on). - If my game crashes enough time for a specific match, then I will take the most salvageable take with the least amount of havoks and do a judge's decisions from the match before the crash. 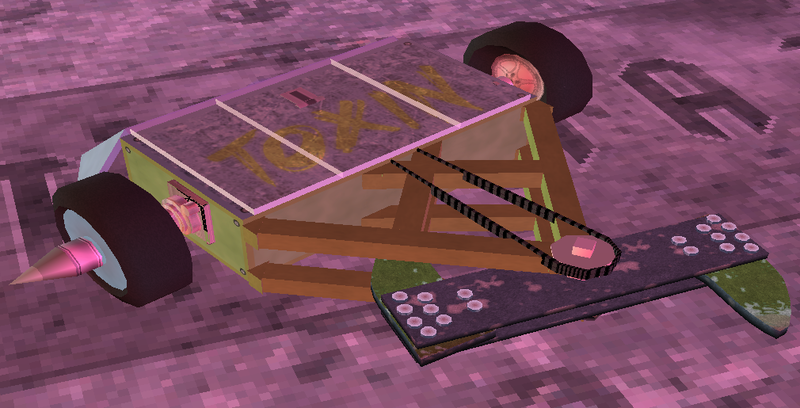 - If a bot shows no controlled movement at all for about 20 seconds, then I will consider it immobile. There will be a visible timer for when it becomes noticeable . - There will be six heats released on a weekly format, with randomised draws for heats and battles. - Seeded bots will have a decicated heat draw for them. So Heat A will have Seed #1, Heat B will have Seed #3, Heat C will have Seed #5, etc. - However, if this tournament is in high demand for it, then I will allow 48 bots to compete, where the Grand Final will have 8 bots will fight in a 1-on-1 classic single elimination bracket style draw. - However, if this tournament is in very high demand for it, then I will allow 60 bots to compete, ten heat finalists, and four Heat Finalists as wildcards. Two heats will be dedicated to the wildcards with a round robin style tournament, where the top 2 of their heat will advance back in the tournament. 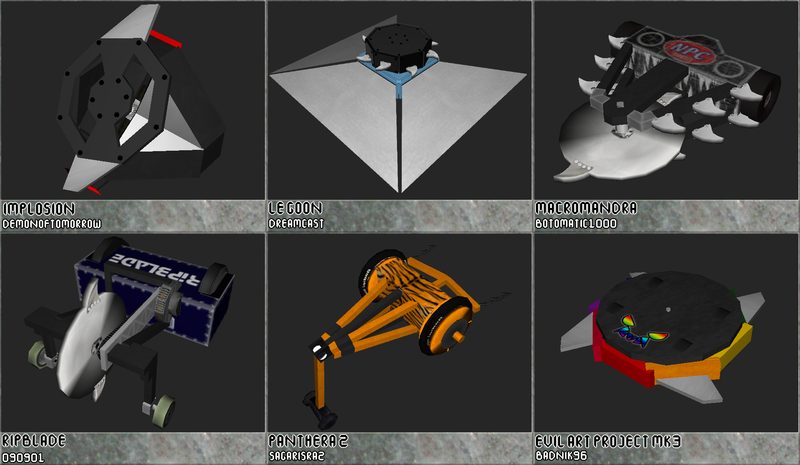 Then, there will be two Semi-Finals where 8 bots will fight in a 1-on-1 classic single elimination bracket style draw, with the final four in the Grand Final Episode. - However, if this tournament is in EXTREMELY high demand for it, then I will allow up to 72 bots to compete, where there will be two Semi-Finals that where bots will fight in the heat format, with the final four in the Grand Final episode. First place will earn the AI of all the entrants, the arena, and a Robots Designs folder with all the entries to play around with, including the rejected ones. This assumes the winner would be okay with accepting it. 9. Arcane - Contaminant Evo! 17. Jammy Dodger (5) - Ampilo Despierto! 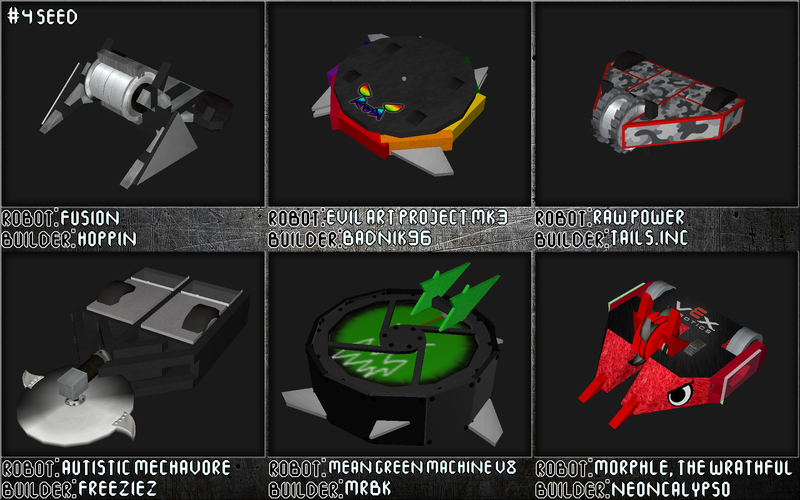 Fatal Risk is a modular robot with one extra configuration. You can look at it here. In all fairness, I've had an idea for this for a while now and I planned on hosting an IRL tourney to end on a high note back in March, but Doot made something not only similar, but also completely overshadowed mine in every way. So I decided to hold back on that idea for a bit, then I decided to do a small mini tourney in Ironforge for the summer just to make sure I still had it in me for tournament hosting. It wasn't my best as I found myself distracted on other life things and just having other issues with my laptop. This time, it's going to be a tournament I will put all of my priorities on. I want to make this the best tournament I will ever host, and one that I will feel proud of completing. I'm probably not going to start this quite yet, but I'd like to create as many improvements and such before this enters signups. - Once bot per member, but if signups aren't completely filled up for a while, then I will extend for another week and allow secondary entrants. - Walkers/Shufflers will get an additional 200 KG, but that weight must be used for the mechanism itself. - Multibots will be allowed, but at least weigh at least 35% of the total weight limit of your bot. - Modular robots will be allowed, but you can enter a maximum of four configurations and you must PM the specified bot type for the configruation to fight. - The only cheatbot2 Components allowed are the Flatmotor, Slow Flatmotor, and the Overkill Motor. Everything else is banned. - Any multibots competing must have at least 55% of the total robot to be considered eliminated, and any melees they fight in will have the heaviest robot compete. - Only VERY minor havoks will be shown in a main heat video, and bots will not be penalized for havoks. However if a robot havoks more than enough times or just straight up crashes my game too often, then the robot will be eliminated and will be referenced to "technical issues" (If the builder would like to see a video of the havoks for proof, then I will upload said video, and for the record, I'd say 20 havoks or crashes would be a tipping point for me to just forfeit it and move on). - There will be six heats, with three 1-on-1 qualifiers per heat. Winners will advance to the semi-finals, but losers will go on to a redemption rumble for a second chance. The winner of that will earn a spot back in the competition, and follow a traditional bracket style for the heat. The Grand Final will also follow the same format. 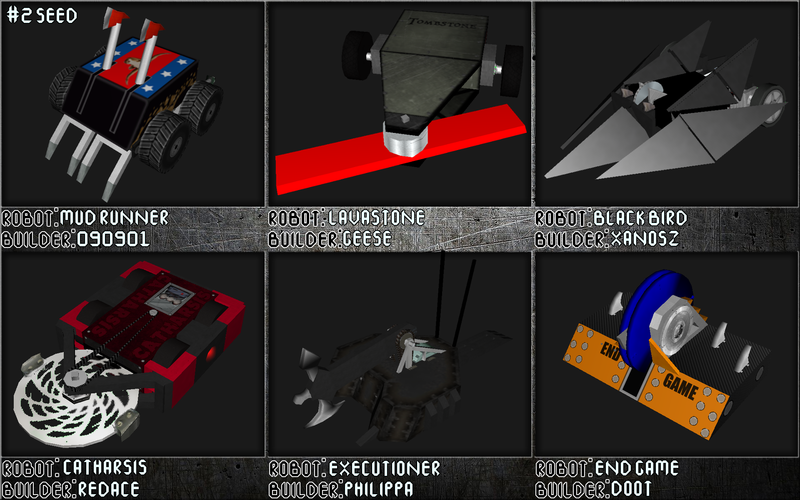 - I will be judging every bot fairly on a spectrum of 45 points from three categories: Aggression, Damage, and Control (in other words, Classic Battlebots style judging). First place will earn the AI of all the entrants, the arena, and a Robots Designs folder with all the entries to play around with, including the rejected ones. 12. TGM - Bite Me! - If a bot does a Havok Explosion which costs the battle for it's opponent, that said bot will get a free restart, if this happens again, that bot will be disqualified. "but redace what about that irl tournament you wanted to do"
Well, I discussed this in the GTM Discord chat, and we agreed that we were sick of IRL tournaments at the moment since there is a large amount going on at the moment, and that pretty much everyone kinda stole my idea, so I decided to put it on hold at the moment and wait for a bit. I also haven't done very many Ironforge tournaments and there isn't much of those going on at the moment. - You cannot use BFE, AAM, Hax, txt file editing, etc. - No cheatbot2 or custom parts allowed. - Bots must have powered two wheels minimum. 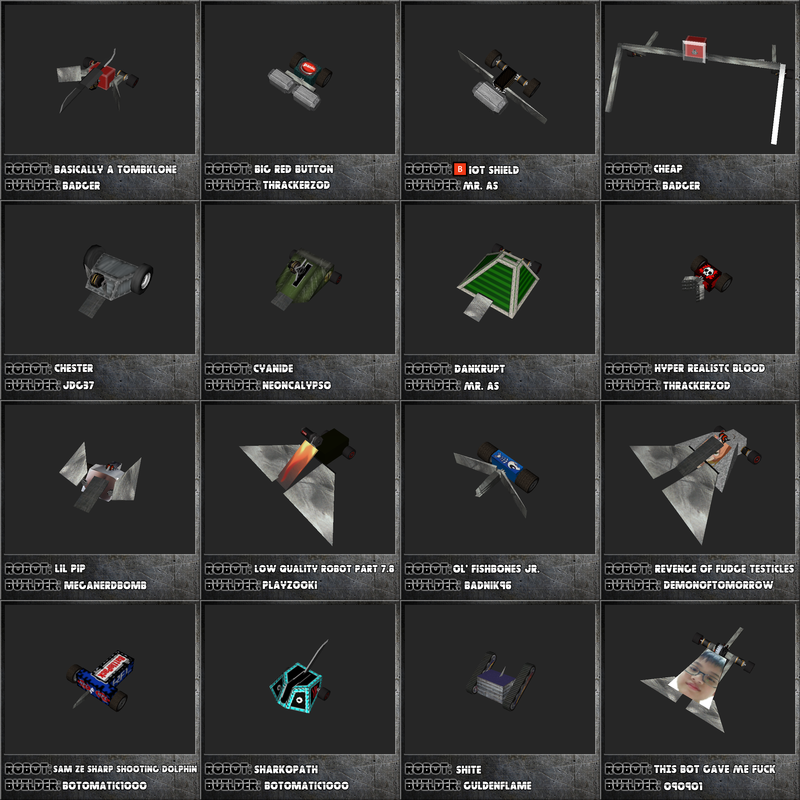 - Interchangeable weapons and forms along with Multibots/Drones are banned. - I recccomend bots that are the best of your ability, and while Jokebots, replicas, IRL style bots, etc. are allowed, but bear in mind that you will be at a severe disadvantage. - You can make an update once and only once (The only exception if it's a skin change or anything very minor). 3. Badnik96 - Ol' Fishbones Jr. I just simply swapped the number in the Class from '2' to 'some crazy number that I found from Techno Destructo'. I then saved the changes without having a backup, and that's where I have the problem I have now with this bot. I can't click on the bot in the Export Designs, or have the bot even present in the teams (Selecting a team in Exhibition mode and in Team HQ) without having my laptop freeze, locking me out of it and forcing me to restart (Task manager didn't work either). I'm pretty sure there's some numbers to replace, but I have no idea what they are, so if anyone who can help out with this bot, that would be wonderful. Edit: I'm pretty sure someone else had a similar issue a while back, but I don't recall if it was exactly this or that similar to what I have here. - DSL 2.2 LW's, MW's, and HW's. - This will be three separate tournaments in three different weightclass divisions, and you don't have to enter all three just to compete in one. - You can enter one bot per weightclass division, but if signups aren't completely filled up within the deadline, then I will extend for another week and allow secondary entrants. - I will enter if there's open spots remaining when the signups are closed. - Lightweights (175.1 - 249.0 KG), Middleweights (249.1 - 399.0 KG), and Heavyweights (399.1 - 800.0 KG) only. 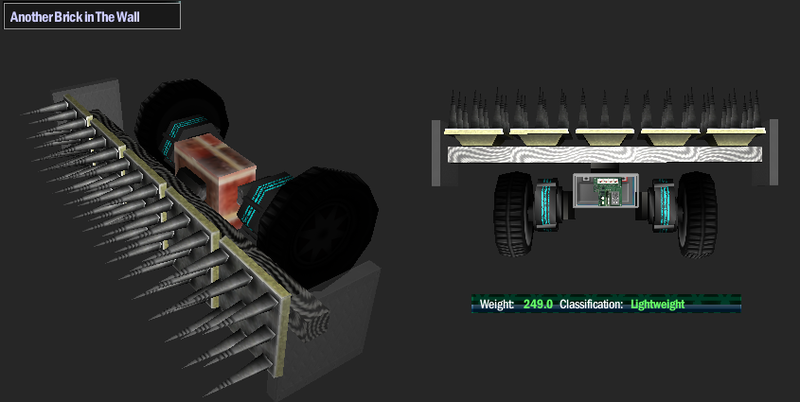 - Walkers/Shufflers will get a double weight bonus, but half of the total weight of the bot must be used on the walker/shuffler mechanism itself. 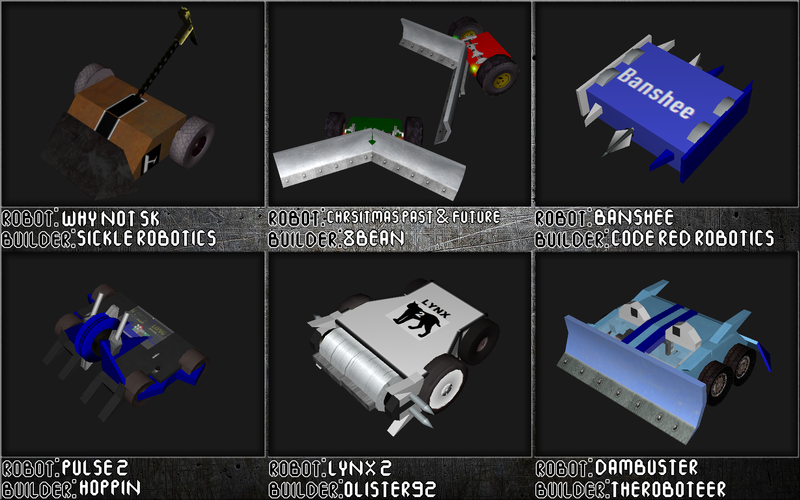 - Multibots are allowed, but for the melee matches, only the heaviest robot will participate. - The DSC IRL packs will be allowed (Even future releases). - Replicas of any existing bot will be banned. Period. - I will send a time limit for those who have not submitted a submission for their configuration and if you do not meet the limit, then I will use whatever configuration I think fits best. - In the event of a tie, then there will be a sudden death melee to decide who moves on. 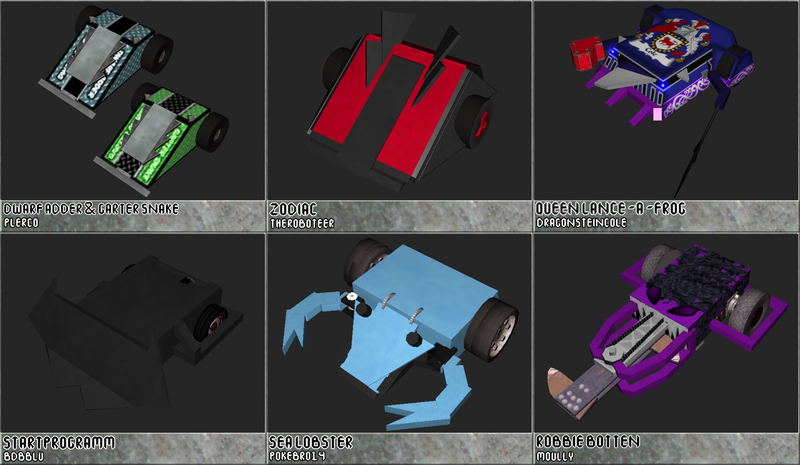 - I will be judging every bot on a spectrum of 45 points from three categories: Aggression, Damage, and Control/Strategy (in other words, Classic Battlebots style judging). - There will be four rumble qualifiers, the winners will advance to the final rumble. - These will be special exhibition battles that I will do for fun at the end of the main tournament. - One melee suggestion per member. - Three to four bots per melee. - There will be no judge's scorecard at the end of these matches (You decide who won really). - Give a specific reason or title on why you would like to see this match become a reality. - I will allow a maximum of eight melees with a specific date on the cutoff point. Lastly, The prize I have planned is to give the arena, a tournament event for Team HQ, and the entire lineup of bots in an AI pack for the champions of each division. Side event winners will be allowed to choose a specific weightclass of bots as their prize. Just to clear this up, this will not be starting up so quickly. I'm only putting this up here so that you have time to build your bot(s) and send them to me when the tournament gets off the ground. That, and I have the Retooled bracket of GTMCS done. I do plan on having signups for entrants be open for about two weeks (one for your primary entries, and the other for your secondary entries). I'll give a notice in advance when I plan on opening them. This way you know when they open and close in adance, and prepare. Statistics will be up to date. Beware of spoilers! Hi, I'm Kris Wolf! vs.
Cookie Cutter HS Design vs. Deadline for Box Selection: 12:00 AM, December 3, 2016. Crouching Robot, Please No VS vs. Hi, I'm Kris Wolf! T vs. Hi, I'm Kris Wolf! Cookie Cutter HS Design vs. Hi, I'm Kris Wolf! *Everyone will be playing this one. If anyone does better than the victim, the victim will die. As for my next tournament... well, I'm probably not gonna do one. - Bots must have two wheels minimum. 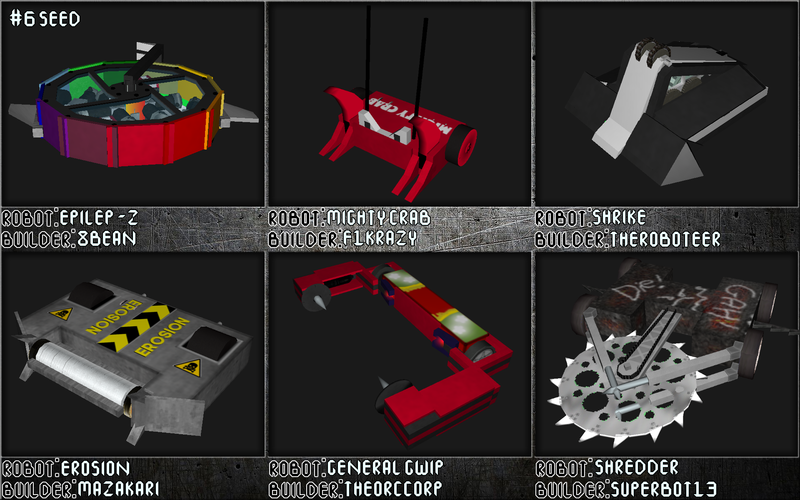 - Interchangeable weapons and forms along with Multibots are banned. - I recccomend bots that are the best of your ability, so Jokebots, replicas, IRL style bots, etc. are allowed, but bear in mind that you will be at a severe disadvantage. - The Winners of the matches will sit on the sidelines, and earn an additional 10000 points. The losers will have to fight for their life in a mini-game. - You will be battling a bot in the shape of a safe. - These battles will have no time limit. 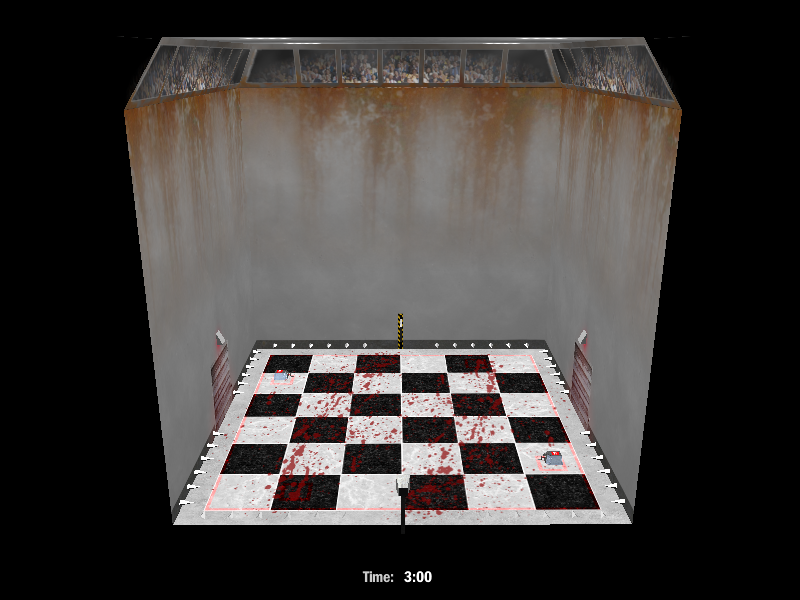 - The arena used will be the Containment Cube (Reskinned, Hazards off). - The goal is to destroy the safe, but if you score the most or the least amount of points, and you'll be sorry. - The arena used will be the Tabletop Arena. - Whoever lasts in the shortest time, or beats the rammer in the longest time will die. - If you don't beat the crawler in any way, then I'll kill you. - Once signups are full, I will PM everyone beforehand on a box to choose beforehand. 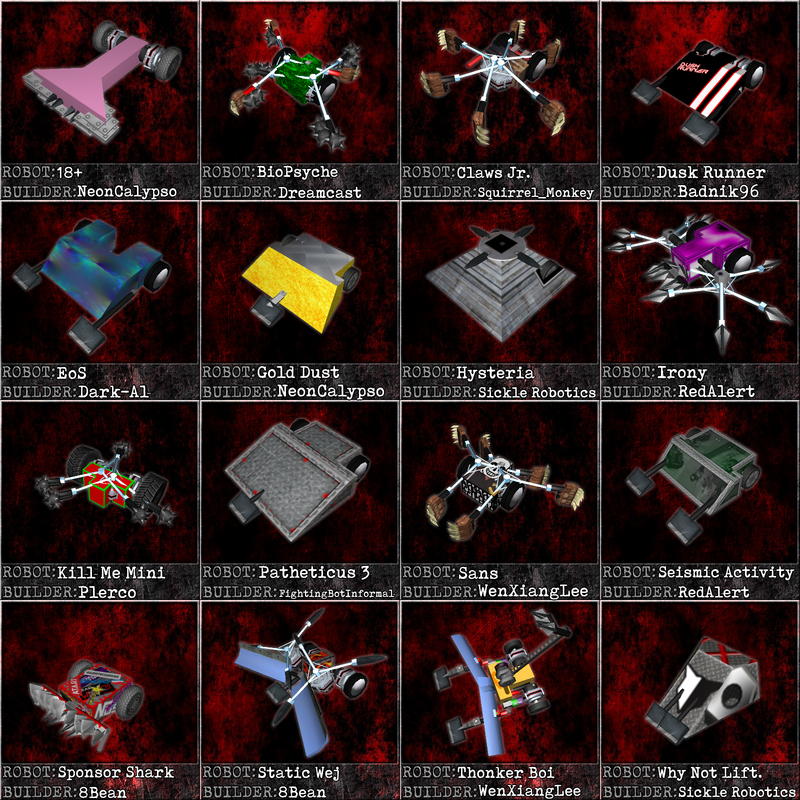 - Victims will be fighting one of 16 different AW boxes with wheels. - If you are a safe player, then you will have inserted a bomb inside, if you are not a safe player, then you will have chosen a box to fight. - If the victims choose a box that has a bomb in it, they'll die. 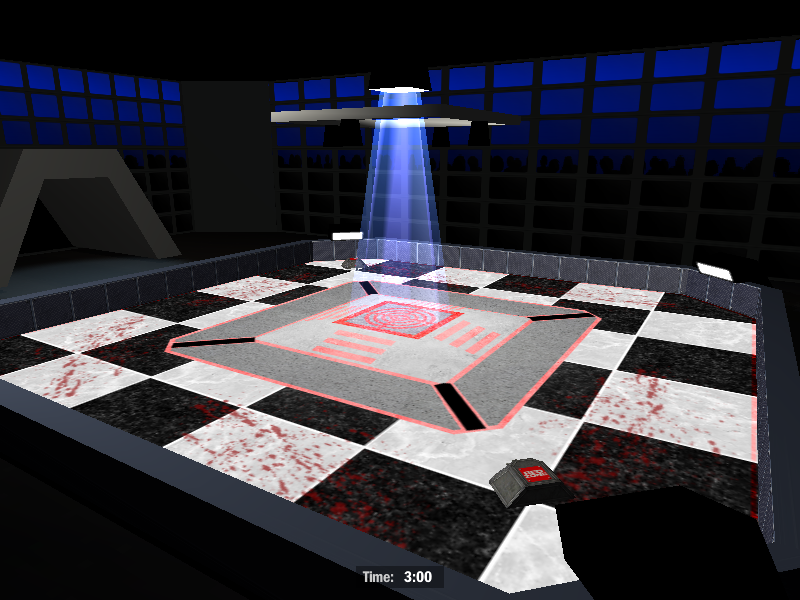 - This will be a four player minigame, and everyone will face each other in a 4-way rumble. - Whoever scores the least amount of points in the match, you die. - You will face off against two lightweights. - If you lose to the lightweights, then you die. 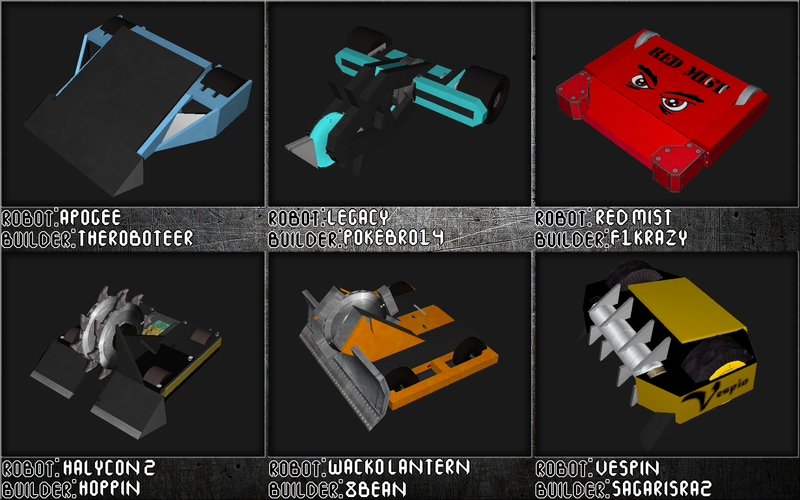 - You will face off against MW Multibot Popups. - If they beat you in the shortest time, or you beat them in the longest time, your blood will be spilled. 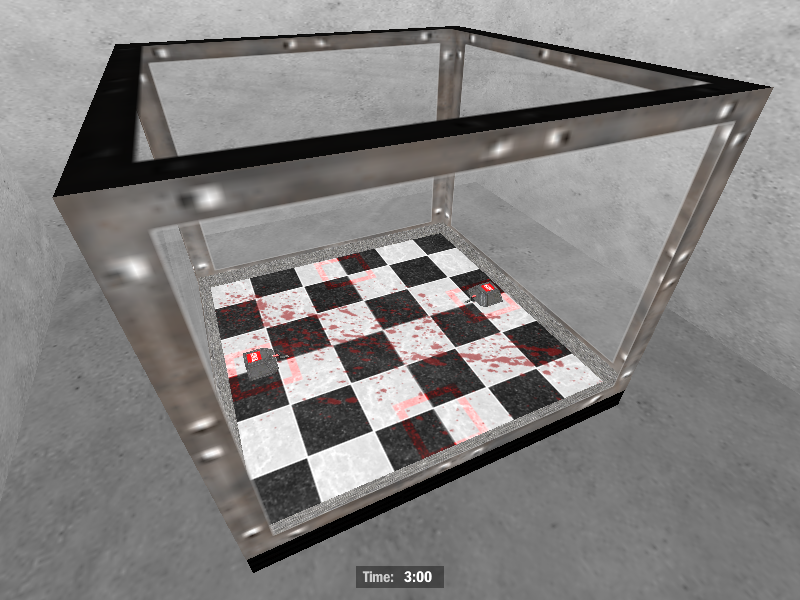 - You will face off against a bot surrounded in an extender cage. - The goal is to tear off as many extenders of the cage as possible. If you tear off the least amount of extenders, there will be consequences. - You will face off against 3 AWs, 3 BWs, 3 LWs, and 3 MWs. - You will face each bot, 1-on-1, and if you win, you will advance to the next bot, with each bot getting gradually harder to beat. - If you beat the least amount of bots then you will suffer. This will be the last minigame if two or more bots remain withing 10 rounds. - You will face off against a SHW HS. In case anyone is a tad unfamiliar with what exactly this is inspired by, then take a look at this video as an example. 2. DeadGenocide - Hi, I'm Kris Wolf! Why not? I might as well. It's alright. Pretty terrible when inverted, but that's good for taking on those nasty popups as they can de-weapon themselves when in that scenario. Fun to drive and it's not bad at gut-ripping things. Originally, i had the small rubber treads on this thing, but it was too fast and couldn't be controlled easily. The VS weapons also helped it self right, but now that they are spinning downwards, now I'm not so sure. Can't remember the exact armor these guys have at the moment. 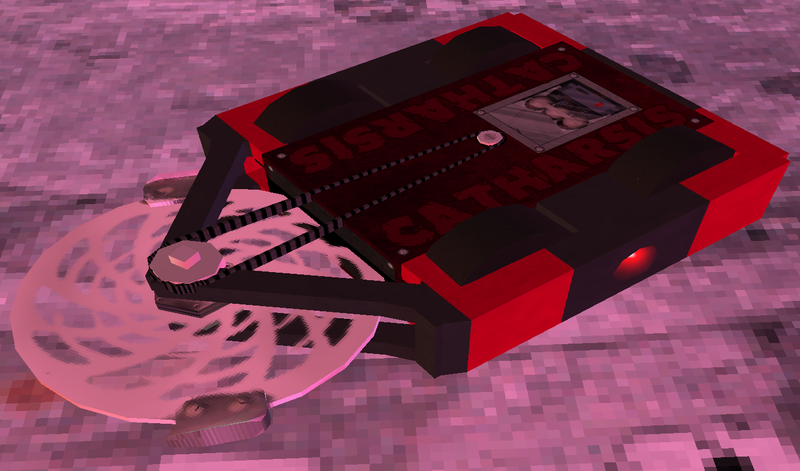 Might edit this post later when Battlebots is over. And yes. They're all named after songs Pink Floyd's The Wall album. Might get a whole team ready with these three. Badger is the host. Good luck. ...Yeah, I'm not so good with names. I bet a few of you guys are aware about this as I have showcased this about a week ago, but here it is. 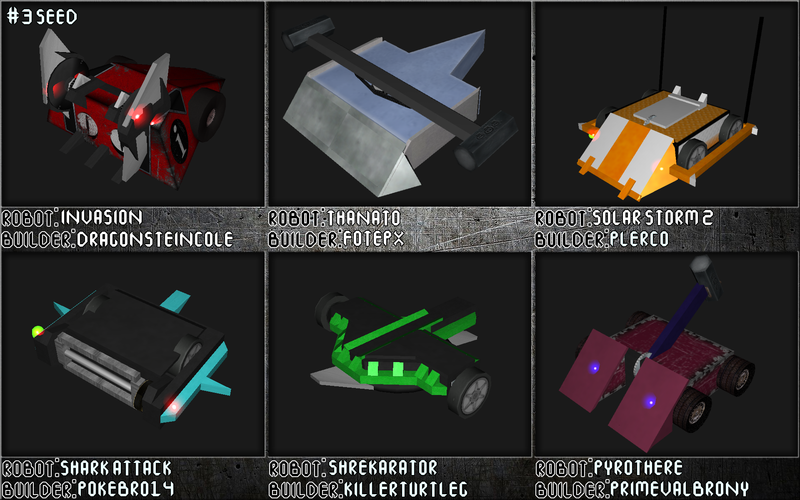 All the bots in this pack were built and skinned by me. Massive Thanks to Thrackerzod for being a cool dude and beta testing this. 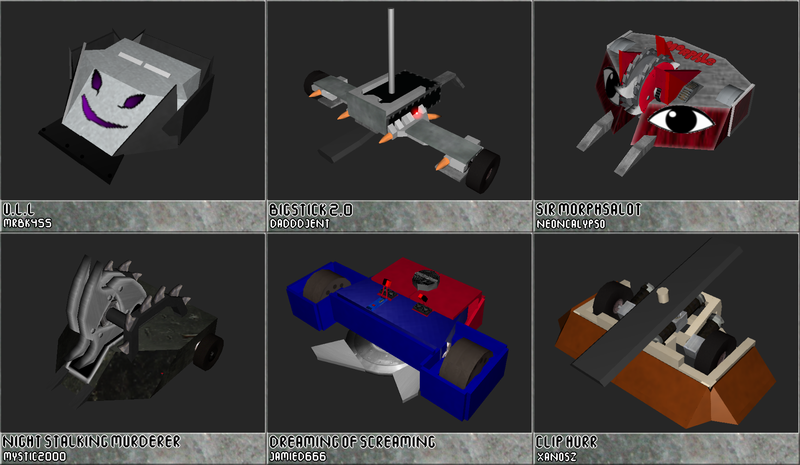 This is an AI pack where I've rebuilt the first 45 stock bots in DSL 2.2 with an IRL style. I've done my hardest to make them as authentic and accurate to the original as possible. 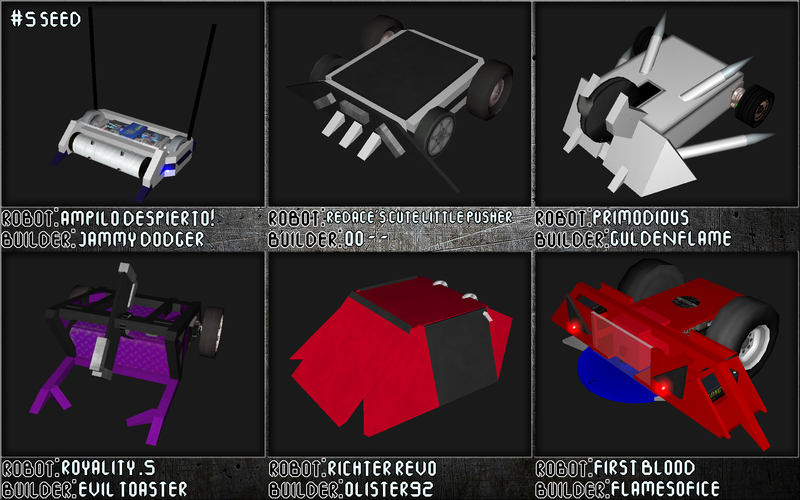 This pack isn't really meant to test how good your bot is but more-so giving you more IRL bots to fight than just replicas. If you want some updated bots that are meant to test how good your bot is, then get something like NAR AI 3.1. NOTE: This will replace any bots in the first 3 slots for the first 15 teams. The Bindings will also override any custom teams that you may have added on from the first few in DSL 2.2, so beware. 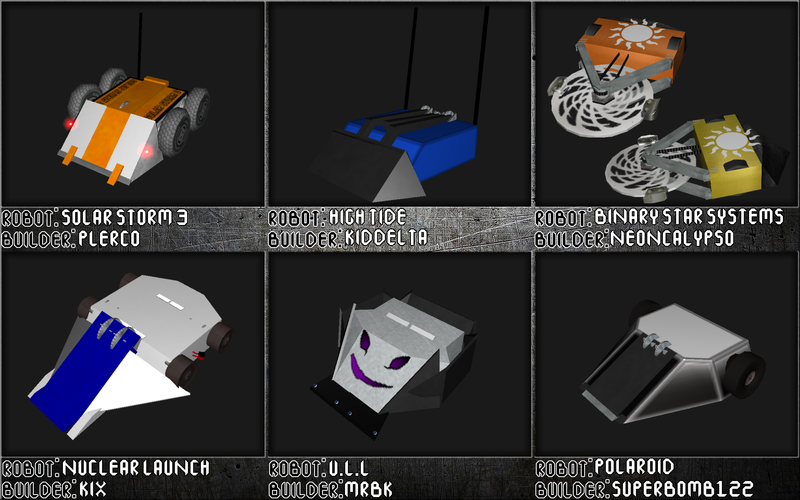 If you're curious on what the bots will look like once you download them, you can find all of them here. 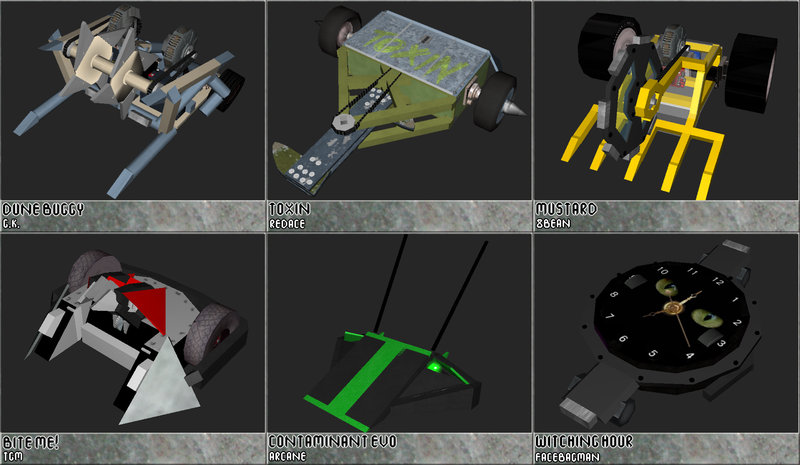 Edit: And the expansion pack which adds two new teams which have the remade RA1 Reincarnated team and the Arthrobotics team is released. Just simply copy and paste these files in the current RA2 with your current Reborn AI folder and you should be good to go.